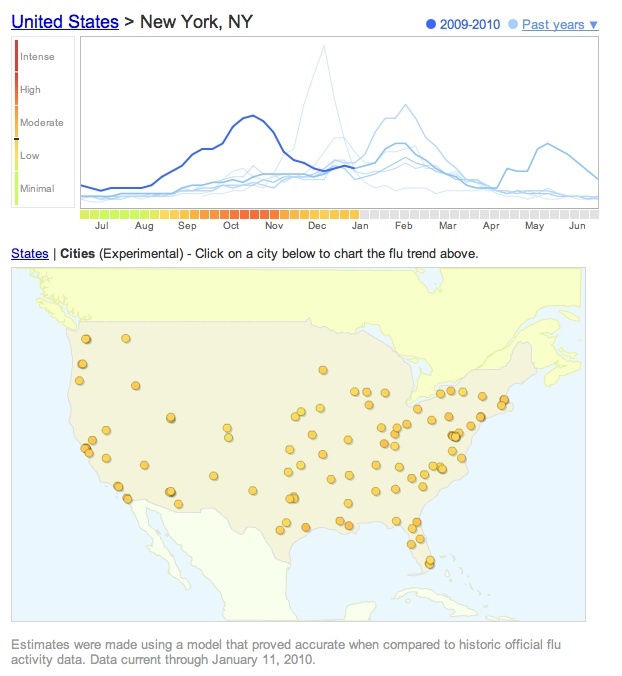 Google Now Tracking The Flu, City By City. So Far, It's Been A Mild Winter. During flu season, one place to check for the level of outbreaks is Google Flu Trends, which extrapolates outbreak levels from the rise in flu-related searches. Today, it launched a more detailed view which maps flu levels across 121 cities in the U.S., including New York City, San Francisco, and Minneapolis. So you can now check to see how your city is doing comopared to past years, or see if it’s a good idea to travel to Chicago in January. As it turns out, after an early spike in flu levels last October, the country is experiencing a relatively low level of outbreaks overall. What happens next is still anyone’s guess, though, because this year’s H1N1 flu strain is new. It could just turn out to be a mild winter, or e could see a more severe outbreak like there was in 1957, when a new strain also hit the country. Another comparison is to the 2003-2004 flu season, when the disease spiked in December rather than October. Who knows why the trend spiked early this year? #Iblameglobalwarming.